Based upon your family’s needs, we will help you custom design an ADT monitored security system at the most competitive price you will find. Schedule your free in home security evaluation today. PROTECT YOUR NEW HOME AND FAMILY. Congratulations! We are so excited for you as a new homeowner! It would be our privilege to help you protect your home and family with an ADT monitored security system. Get information on your options. IT'S TIME... FOR YOU TO EXPERIENCE RENEWED PEACE OF MIND. Whether you are a recent victim of a burglary or feel it’s just time to get your family protected, we would love to go over your security options with you and give your family a reassured sense of security. It will be our honor to help you provide a safe place for customers and employees, reduce your loss from theft and manage your business from anywhere. 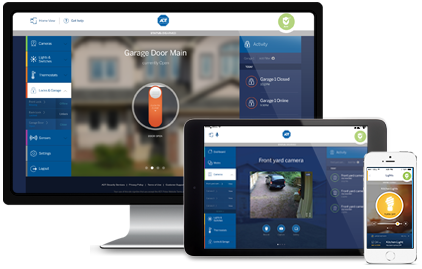 Check out your security options including ADT cameras. ADT Pulse is our most popular home security system offering you remote security from your mobile devices and options for life safety, cameras and home automation. Your peace of mind starts with us helping you create the right security solution for your family's needs and giving you affordable options with an in-home security evaluation. If you have a good idea of what you would like, we can help you go over the pricing options for security monitoring and equipment... then schedule your installation. What Type of ADT HOME Security System is Right for You? Next step: Call us to schedule your free in-home security review. You may call us to go over your options over the phone or fill out our online order form to get a quote and we’ll call you to schedule your installation. Next step: Your best option is to have a security professional come out to look at your existing security equipment and decide what can be used. You will often be able to save significant money and you will still have all the options for upgrades and modern day technologies. Call to schedule your free in-home security evaluation. Next step: You will need to schedule to have a Security Consultant go over your plans and walk the job site with you and/or your contractor. We will then be able to go over options for security system pre-wire and equipment with you and schedule an installation. Call to schedule your free consultation. To get started now… call 1-800-310-9490. ADT SecurityPro has been protecting families in since 1999. We have installed over 70,000 ADT Monitored Security Systems and are one of the Top 10 Authorized ADT Dealers out of 250 nationwide ADT Dealers. Our experience gives us the expertise to help you design a system that is right for you and your family. We understand we are in the business of saving lives and giving you peace of mind knowing you are protecting what matters most, your family! ADT SecurityPro's unique advantage is that you get the service of a local security company, backed by the most reliable Security Monitoring Center Network of ADT. We will have a Security Consultant come to your home for a Free Home Security Review to help you plan for the level of protection that is right for your family. One of our ATt Certified Technicians will then install your security system and give you a demonstration of how to use your new ADT Monitored Security System. Many security companies today, including some ADT Authorized Dealers, are just selling home security systems over the phone and are not providing customers a free home security evaluation. For many homeowners, having a Security Consultant visit your home to help you plan the best security solution will ensure you get the right security alarm system to meet your family's needs. It is often very difficult to create the optimum security, camera and home automation system over the phone. Many security companies today are trying to increase profits by doing business online and taking phone calls. Some are even just shipping equipment to homeowners to do it themselves and charging a monthly fee to monitor the system. If you are a DIY (do it yourself) type of person this might be a good option, but for most people having a local security company be responsible to design, install and service their alarm system is the most beneficial to them. One of the main reasons we are one of the highest rated security companies in the United States in because we still have local security professionals who will meet with you, for free, to help you go over all your options. If is extremely difficult, nearly impossible, to truly help you get the proper security system setup over a 5 minute phone call. Over the phone you'll get a cookie cutter system that everyone gets, instead of a customized solution that best meets your needs. We still do help homeowners over the phone ourselves, because people demand it. However, we let everyone know that our most satisfied customers have taken advantage of scheduling a free home security review. Go with the highest customer rated security company. Cutting Edge ADT Pulse Security Equipment >>> Leading the Home Alarm Industry! ADT has been innovating the security market for over 140 years. Thinking back to when we began, we used messengers on bikes to relay emergency information across town. Now, we are the leaders in remote security connecting millions of Americans to their home from a mobile device. No other company even comes close to the number of families who have cameras installed and can view from their mobile devices or a computer with Internet connection. Remote security has changed the value of getting a home security system installed with home automation. HD Cameras with remote notification of motion, letting you know anytime someone comes onto your property. These come with live viewing at anytime and 30 second recordings of trigger events that you can view at anytime. Automated Door Locks give you the convenience of key-less entry, lock bumping protection and the ability to remotely see the status of your door lock from your ADT Pulse mobile Apps. Thermostat control includes easy setup of daily schedules from your web portal and the remote ability to see the temperature from your mobile App and adjust the settings. This helps you save energy and gives you comfort in having the temperature of your home just right. Lighting control of Z-wave enabled light switches, modules to plug in lamps and light bulbs. Never come home to a dark, unsafe house or leave lights on wasting energy and money. You can also setup a lighting schedule to make it appear you are at home when traveling on business or vacation. Garage door opener and controller with the mobile App to remotely see if the garage door is opened or closed. Also, you can open and close the garage door from the App and set up alert notifications if you left your garage door open for a long time. Integrate with third party products like Nest thermostats and Ring door bells. 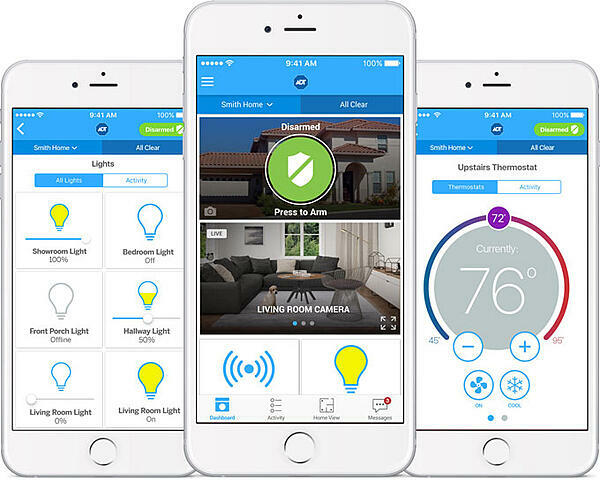 Security Alarm System monitoring allows you to remotely see the status of your security system and ARM/DISARM it from the ADT Pulse mobile App from devices with an Internet connection. You can setup alert notifications of emergency events such as burglary and police panic buttons being pressed as well. Life safety monitoring of fire, flooding and carbon monoxide detection can be setup to remotely notify you of any emergencies at home. "What can I say about California Security Pro that hasn't already been said by all the other reviews.... this company is the pinnacle of customer service." "We just had an ADT security package installed, they were expedient, very knowledgeable and really courteous... impressive!" "I must say, I have dealt with way too many Alarm companies and I think I finally found one I could say "WOW" to."